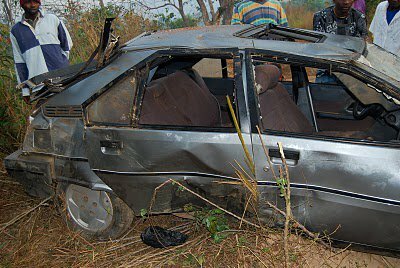 James reports that on his way back to Freetown to pick up his family, he encountered yet another road accident. With the frequency that he must make these trips back and forth to pick up supplies, it is becoming more and more imperative that NHA purchase its own vehicle. The reliability and safety of renting cars is very risky at best. The vehicle in front of James on the road to Freetown, loses control and flips into the weeds. Like many things in Sierra Leone, renting a car in that country is a much different process than in the United States. On most occasions after you pay a hefty rental fee, the owner of the car insist that you use his driver as well. Unless you know who you are renting from very well, you are at the mercy of the driver as to his driving skills or the safety conditions of the car. Finding a skilled, safe driver in Sierra Leone is a rare find. Finding a car that won't break down several times on your journey is just as rare. for seatbelts or child restraining seats. In fact very few cars have seatbelts. we were delighted that they made it back to the Compound in Kabala without any mishaps. Little Roo did present the family with a worrisome matter when he spiked a fever and sores popped up on his throat as they made their way home. Though smiling, Roo looks rather thin and feverish. I am happy to report he is improving and we are hoping the peace and quiet of Kabala will help him to heal more rapidly. Once back home at the NHA Compound, Roo takes his medicine and vitamins. Back home, Kadijah tidies up the grounds, sweeping away the litter that has accrued in front of the house. And Vicki takes in some much needed rest after the long drive. Several boxes of important medication are on their way across the Atlantic today. This means that upon their arrival through Lungi, James will yet again make the trip - relying on someone else's vehicle and driver - to Freetown and back. And when he returns to the NHA Compound, he will be making distribution of the medication to the area village clinics - again at the mercy of an unknown rented vehicle and driver. For the past several years, the NHA Compound has been our focus of fundraising. Now that we have completed the compound we must turn our fundraising attention to some very important operational matters that allow NHA to perform its duties both in Sierra Leone and in America. We'll be discussing the further needs of NHA in posts to come, however today we want to reiterate the need for a NHA vehicle in Sierra Leone. 6 February 2010, James survived after being flipped several times in this car. Two years ago, James was in a horrific accident. He survived only by God's grace and mercy. On that day, a driver refused to slow down or listen to James' urgent pleas to drive safely. The taxi was filled with people, including a small baby which James held in his arms as the car flipped - over and over. The car stopped just inches away from rolling over a high cliff. 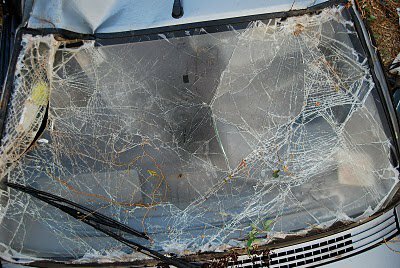 It was a serious warning for NHA, a warning that we must not rely on others many with puffed up attitudes, that have displayed time after time reckless behavior in poorly maintained vehicles. We must make supply trips to and from Freetown, our work demands it. However, paying good money to rent vehicles with drivers that put our staff in jeopardy is not prudent. James has informed us that there are good used certified cars out there beginning at $10,000. Anything older or less priced has more than likely been poorly maintained and driven very hard. He knows many good mechanics in Kabala that will help to maintain and service the vehicle. Having our own car won't keep us out the way of those crazy drivers as they travel the roads, but it will give us more control and ability to practice safety.